We couldn't leave the south without getting some barbecue so one night for dinner we went to Buxton Hall Barbecue for whole hog Eastern NC style barbecue. 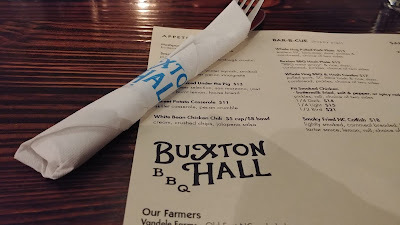 I had read about Buxton Hall in Bon Appetit and in Southern Living so I was excited to try it. The building housing Buxton Hall is the old Standard Paper Sales Company building at 32 Banks Ave in the South Slope. In the 1930s, the building housed a roller skating club. 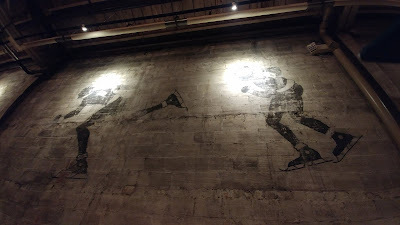 It still has the original maple floorboards from the rink along with faded murals of polo players and skaters on the cinderblock walls. 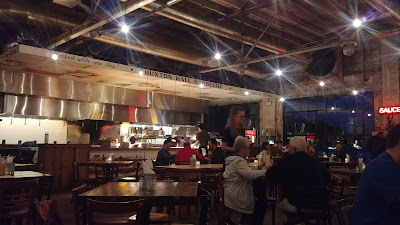 Along one side of the room, you can see the open kitchen above which the slogans “whole hog bar-b-cue!“ and "smoked while you sleep” are emblazoned in black script. 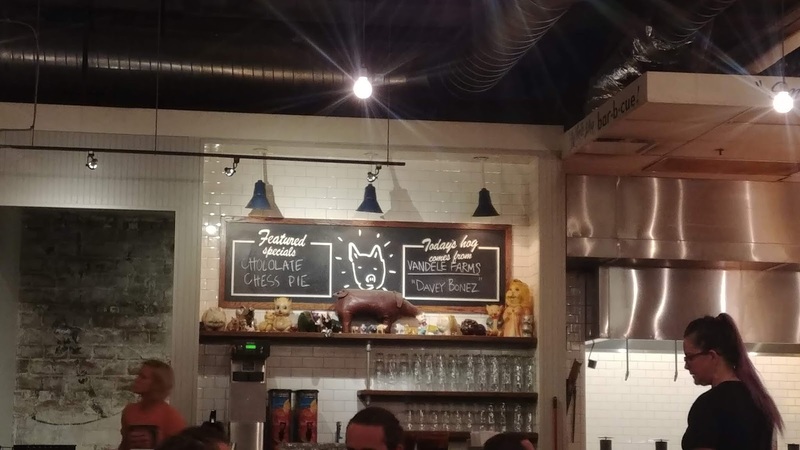 There also is a sign with a dessert special and telling you from which farm today's hog comes. We started with Smoky Pimento Cheese (pickles, fruit preserves, grit crackers). 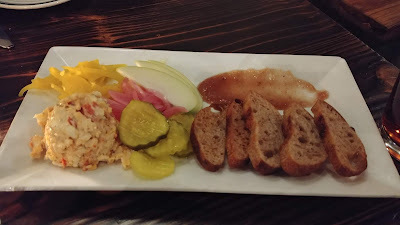 There was a light smoked flavor to the pimiento cheese. We pretty much hoovered up this plate without thinking much about the food other than "mmmm yum more." 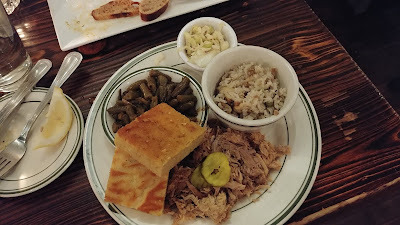 cornbread, choice of two sides). For our sides we chose Chicken Bog (rice, sausage & peas) and Green Beans (cooked under a bbq pig). I had never before heard of chicken bog. I think we asked for no sausage because it was spicy sausage? I can't remember. It was simply chicken and rice to me. 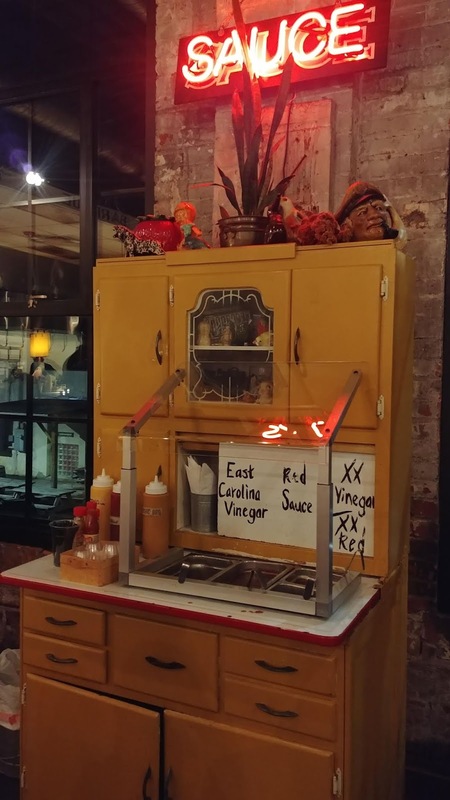 I'm sure the hot sauce served on the side and the addition of sausage spices up the bog. SP doused his share in sauce! The pork was so pull apart tender, so good. But my favorite part? Those green beans. So mush smoky, piggy, vinegary, peppery flavor. I couldn't get enough of them. 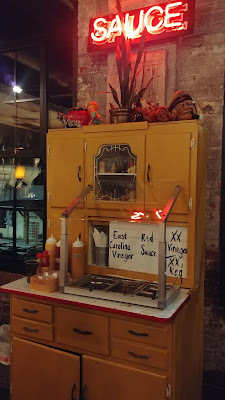 There is a Sauce Station that SP checked out but in the end, I was happy with unsauced pork. We really liked Buxton Hall. There was lots of space for the wheelchair to move around. It was casual and relaxing. I love finding out the history of buildings and seeing them preserved in new ventures. Our server was fantastic. The food delicious. They don't take reservations, but that wasn't a problem for us on a Tuesday evening around 5:45 pm. 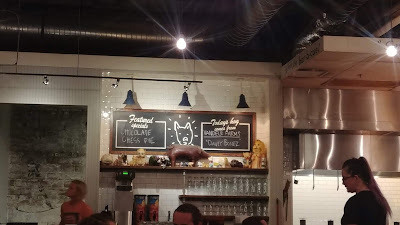 There is a full bar - and they have slushies. I really wanted to try the Bourbon-cherry cola slushie, but it was a chilly day (to me) so I figured that wasn't a great idea. Instead we had delicious fresh brewed iced tea. We'll be back for the pork and green beans and slushie!